Small and mid-size venues often have wireless coverage problems that can be solved easily with an off-air bi-directional amplifier (BDA) or RF booster drive into indoor antennas. However, the required location for the donor antenna (off-air is outdoors) is too far away for coaxial cable to be practical. Optical Zonu’s Antenna Extender solves this problem by providing an easy-to-install fiber optic link between the donor antenna and BDA. 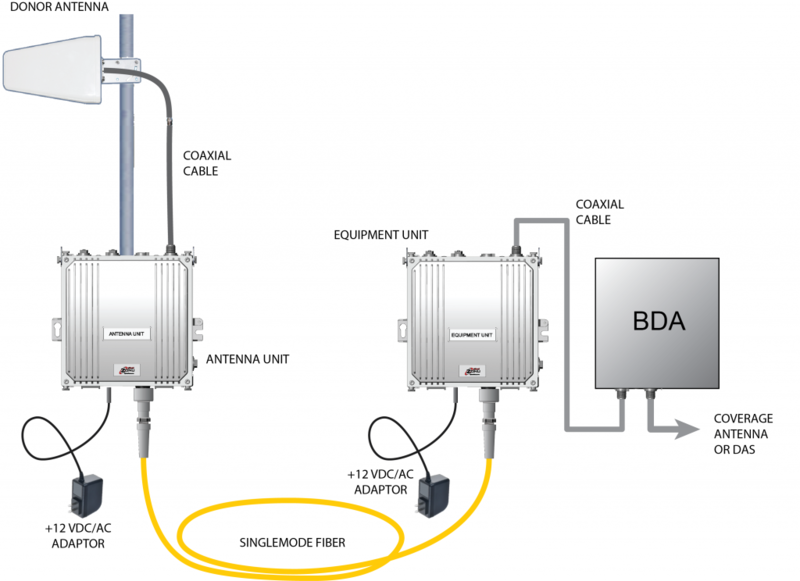 The link consists of a compact Antenna Unit that connects to the donor antenna and a mechanically identical Equipment Unit that connects to the BDA. The two units are connected by a single strand of optical fiber to provide a robust RF connection for distances up to 3,000 ft. The units require no adjustments and can be powered locally or remotely. Each unit can be installed indoors or outdoors. For outdoor installations, Optical Zonu also provides the outdoor-rated fiber cable assembly to connect the units. This cable can be fiber-only or hybrid (fiber-copper), which includes the DC power connection for the Antenna Unit. The Equipment Unit connects directly to any BDA with up link transmit power up to +24 dBm. The RF Antenna over fiber extender provides an essentially lossless down link RF connection with minimal impact on system sensitivity. RF connectors are rugged N-type. Single mode fiber is standard but there is an option to support multi mode fiber. We offer a broad range of Distributed Antenna System fiber link solutions.